Abbie plus her boy plus a new member of his lab plus her visiting parents and I all went off on a hike down by Malibu. It should be a nice little loop, except for this creep. How he gets away with it so close to Malibu, I have no idea. The trail had been going there long before he bought the property. And he promptly sued his neighbors to force them to give him the same sort of easement the trail has. A clear case of good fences making bad neighbors. 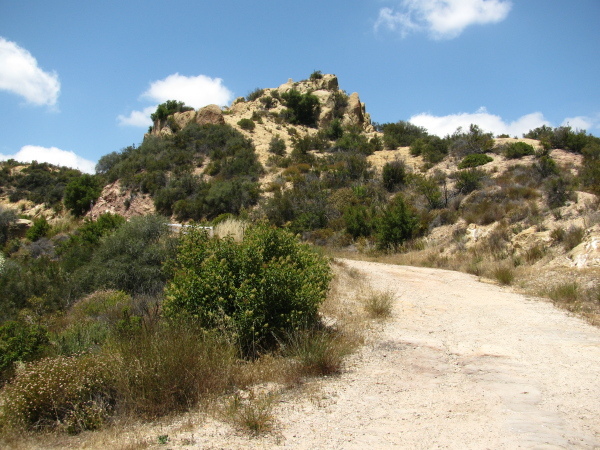 The hike starts at the end of Corral Canyon Road, which heads into the young mountains with many curves and steep drops from highway 1 just "north" of Malibu. The road turns to dirt and gravel and widens into a parking lot just before a gate. The fire road beyond may be used by bicyclists and the various single track trails from the spot may not. Castro Motorway continues on from the end of Corral Canyon. We didn't get to see this part of the trek. Alder Creek is apparently a "trail that was" in the guidebooks even though I found it on the current (Ha! It's getting rather old and out of date. They need to do a new one.) forest map. There seems to be very little to be found about it online. There's a little on it by one Caltech alum who is so often a great source on the local trails. There's also an errata site for Trails of the Angeles that notes you can hike this trail now, but then says it's not particularly interesting. In the 10 years since folks have known it was open, there doesn't seem to have been a lot of interest. 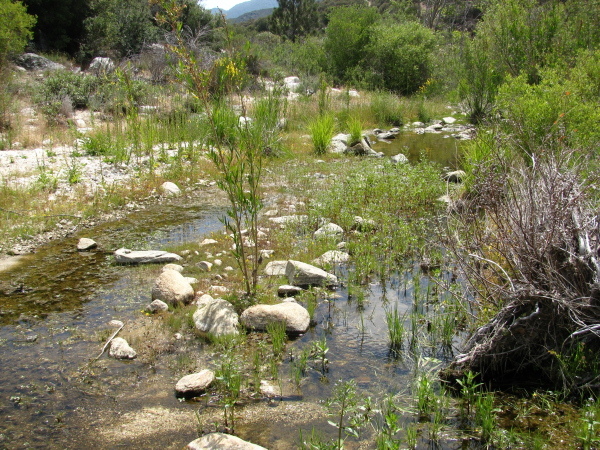 The trail heads both ways from where Upper Big Tujunga Road (Between Angeles Crest and Angeles Forest highways) crosses Alder Creek. There used to be a small lot a hundred feet off, but now it has been blocked by a load of dirt as has all the roadside parking for a quarter mile. One presumes this is to discourage use of the creek area to protect endangered and threatened wildlife. The information I could find says each side is marked by a 4 inch pipe only. I didn't find the one for the downstream side, but didn't look very hard. Next to the one for the upstream side was a small sign asking people not to use the stream side area. The condition of the trail suggests it gets regular, but light usage. The footprints I saw that still showed tread were all my own. The double line of a single bicycle seemed to be the most recent passage. There were a few spots that the hillside was sliding a bit, but the track of the trail never totally vanished. Brush was generally light, but once in a while it reached out over the trail. There were two spots of unavoidable poison oak, one of them with it making a good try for the faces of hikers. I parked among a few other cars off the road around a 4.5 mile marker on Upper Big Tujunga and hiked down the road almost to the bridge and mile 4.18. As I went down, I was able to see bits of well established trail along the top edge on the other side of the small canyon with the creek. This assured me that there was a trail. Just before getting to the bridge along the road, I saw the trail marker just a little ways down the hill. 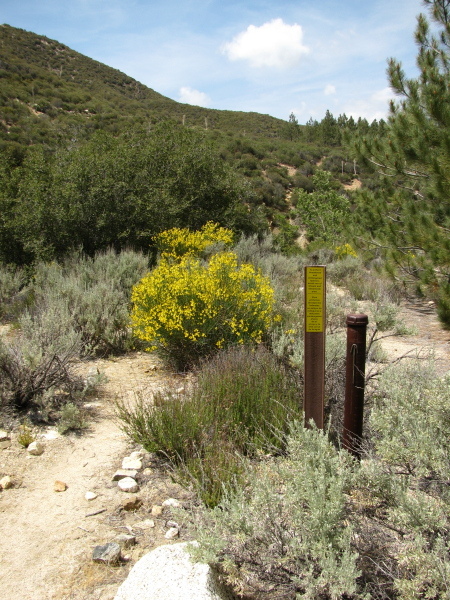 The trailhead is marked by a single wide pole with an arrow. I didn't see other markings on the pole but I didn't realize to look. A second sign asks the public to please refrain from disturbing the creek area. Flowers were plentiful in the creek area. A little bit of water flows in the stream bed where the trail makes its first and only crossing.